Sedimentology is a branch of Earth science that studies sand, silt (mud) and clay. Humble sediments are vital to our everyday lives, containing the world’s stocks of oil and natural gas, as well as a variety of precious metals. Sediments are often mined to construct roads and buildings—take for instance the material need ed to make concrete or the clay in bricks and plates. 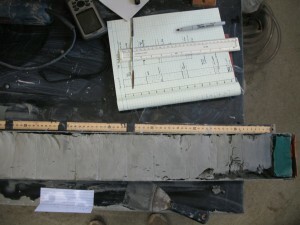 Layered sediments also give us a chance to study the Earth’s past. A sediment core—a tube driven into sediment to bring back a sample—can show us layers that we can use to assemble a history of our planet. How does sediment help us to understand hurricanes? By looking at sediment from the bottom of ponds very close to the ocean, we can find layers of sand that stand out amidst the thick layers of silt and clay. Close to the ocean, the sand indicates that high waves or a storm surge drove sand from the beach and the ocean margin into the pond. Based on the amount of sand present, we can work back to see how large a storm would need to be to drive a given amount of sand ashore.